Pinkberry is, in a word, amazing. I first tried Pinkberry about 5 months ago when they opened at a local mall. I happened to be at the mall, meeting friends for lunch, before heading to David's Bridal to try on bridesmaids dresses. As we were leaving the mall, these wonderful Pinkberry employees had samples outside- pomegranate froyo with strawberries and mangos on top. Delicious! and I had never had froyo that was so good. After we were done dress shopping, we headed back to the mall to our respective cars. But, before I took off, I had to sneak back for yet another sample of what would become my favorite treat in the history of treats. Since that fateful day, I've become obsessed and I've introduced many to the wonders of Pinkberry. With their fantastic flavors, fresh fruit toppings, delicious and plentiful dry toppings (think: fruity pebbles, granola, and yogurt chips, among other things)﻿, and liquid toppings (honey, caramel), it's difficult to say no to more froyo. 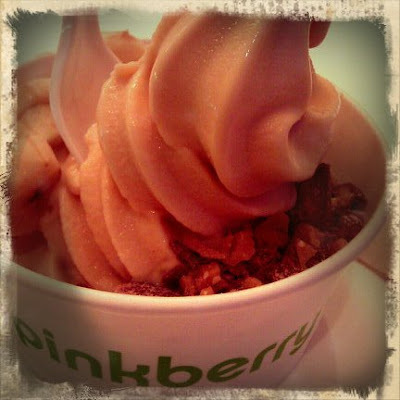 Tuesday, I headed with my mom to the new Citrus Park Pinkberry location to try their newest flavor: Peanut Butter. A standard PB calls for their organic strawberry jam and toasted breadcrumbs, but I decided to forgo those toppings and opted instead for bananas and heath bar pieces. 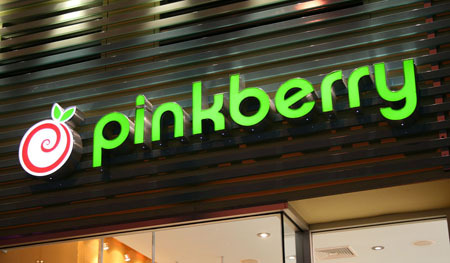 Have any of you had Pinkberry? What is your favorite flavor and toppings combo? We have TONS of froyo places here but they're FINALLY building a Pinkberry nearby! YAY! And yes, I could not get into WP. I saw that the only way to do it the way I wanted was to host your site somewhere and I was not prepared to do that. It was confusing too! As for my camera...all the pics i've taken so far are with my Android phone, believe it or not! I use the RetroCamera app!